Sarah Ellen was described as beautiful and infatuated with ritual magic. According to the inscription on her tombstone, she was born in Blackburn, England in 1872 and died in 1913. There are several contradictory versions of the story, but the likeliest one posits that she died while her seafaring husband – one J. Roberts – was in Perú on business. On her deathbed, Sarah cursed the neighbors who accused her of being a witch, saying she would come back from the afterlife in eighty years to exact revenge. Not taking any chances, her body was shipped to her husband in Pisco, where it was buried. Another less gothic account states Sarah was the wife of a sea captain; she took ill when his ship pulled into the port of Pisco, died and was buried. Among the remedies she consumed to treat an unspecified malady was a red liquid -- interpreted by some as a regular dose of blood. Fact and fancy, thus intertwined, nested in the minds of the residents of the Peruvian city, passed along through generations until the year 1993, the predicted year of her resurrection. Crowds gathered in fear and excitement, wondering if the alleged vampire would come to life, and the authorities found it prudent to post extra security just in case. It was rumored that the slab covering the tomb had made a creaking sound, but the vampires did not emerge. This, too, was attributed to the fact that pilgrims and shamans had periodically come to pray at her tomb, in hopes of keeping the prophecy from coming to pass. We shall end this section on a somewhat lighthearted note. Cuban folklorist Gerardo Chavez’s Imaginario Popular: Mitología Cubana, a scholarly work, deals with the urban folklore of Havana and the legends that surround that city. One of them involved a 19th century grande dame who would have been considered a vampire by many, driven around the cobblestoned streets of Havana in a dark carriage, resembling a horse-drawn hearse, dressed in black. Described as a “pale and haggard woman who appeared to be on the verge of death”, her slim, veiled figure nonetheless projected an aura of unearthly mystery that men found alluring. The accoutrements of her colonial mansion were more proper to a funeral home. Anyone with a passing interest in the paranormal will remember “Gef the Talking Mongoose” – one of the strangest cases on record – involving an entity in the Isle of Man that held long conversations with the members of a household between 1931 and 1937. Around this same period of time, the Spanish city of Zaragoza was enthralled by its own “duende” (imp or goblin) that spoke to a family from the depths of a kitchen stove in 1934, becoming well known to readers of the local press and even overseas, as the London Times also carried stories of the unusual poltergeist. A similar entity filled the chronicles of the Spanish settlers of the city of Valladolid in the year 1560, a scant thirty-five years after the destruction of the Aztec Empire. Pedro Sánchez de Aguilar had been born five years before the first manifestations of the paranormal phenomenon. His grandfather had been among the first Spanish settlers in the Yucatan Peninsula and his siblings were “encomenderos” (land grant holders). As the youngest brother and landless, Pedro became a priest, rising to become a curate, the dean of the Mérida Cathedral, and hold other important posts. 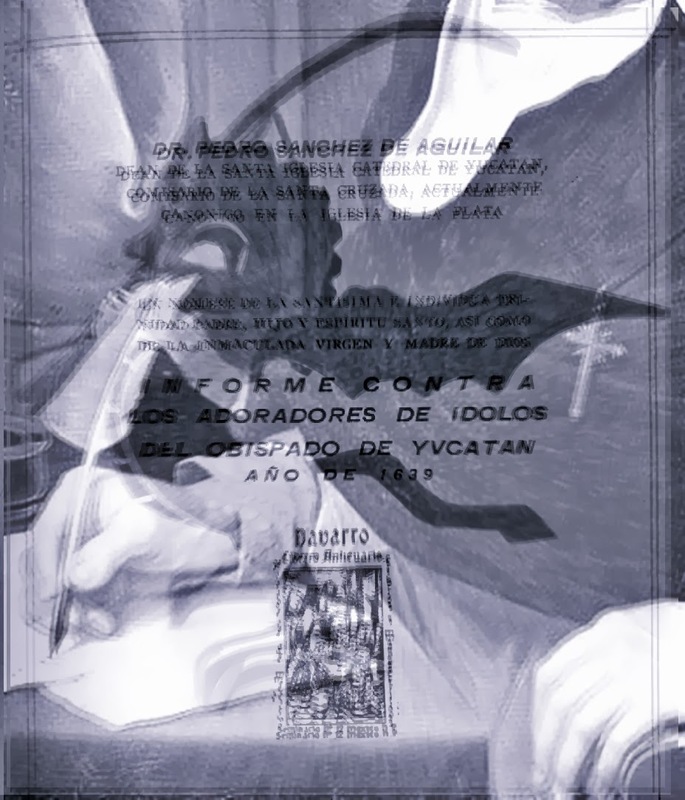 His writings on Mayan language and customs are still read today, but these are hardly as compelling as the story of the Duende de Valladolid, which appeared in Informe contra los adoradores de ídolos del obispado de Yucatán. (Barcelona: Linkgua 2007). Picking up the story centuries later, Valle Arizpe writes that the chosen saint was Saint Clement, and that a carver of holy images “carved a statue of Saint Clement holding in his hand a chain to which a hideous demon was fastened, its mouth muzzled, covered in gold leaf.” The townspeople, however, failed in their promise to join the procession, and the priest took the statue to the convent alone.